A Recap of the 42nd JACL National Convention | JACL PSW in Blogland! ← Youth Summer Opportunities! Get involved! Every two years, JACL hosts a National Convention. 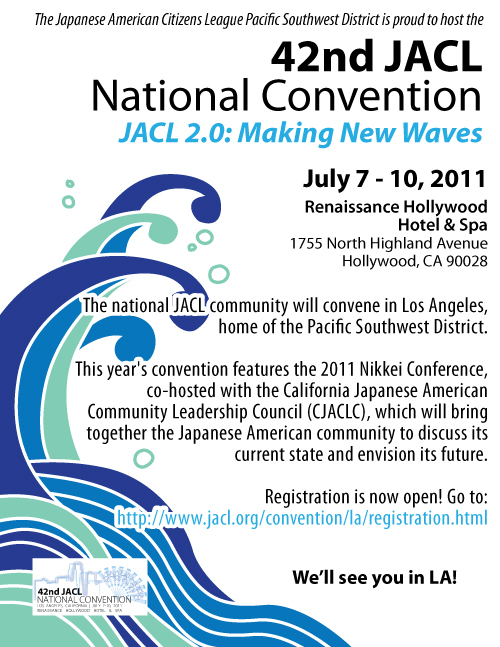 This year, the JACL 2011 National Convention was held from July 7, 2011 to July 10, 2011 at the Renaissance Hollywood Hotel. The convention was held right at Hollywood and Highlands. Many know that cross street to be quite busy, yet that was not the only busy thing. During the four-day convention, the Renaissance Hollywood was filled with JACL members, community leaders, and students eager to get involved. During this conference, much focus was placed on how to get the youth involved in the community. Currently, the JACL PSW chapter hosts Youth CAN, a program to engage high school students into the Japanese American community. Meeting once a week, students have workshops and projects that build their knowledge and passion for the community. The Youth CAN students came to the conference. As they sat through workshops dealing with Art and Culture to Civic Engagement and Leadership, the students took away new outlooks on the community and gained a passion to get involved.